What is a Djed Pillar? The Egyptian djed pillar is a symbol of stability. It is said to represent Osiris's spine. You can almost picture a spine when you look at it. Where would you find it? The mythological shape was commonly etched on tomb walls. It was also shaped into amulets that could be worn or carried, or tucked into mummy wrappings. Osiris: The djed symbol was said to represent the spine of Osiris. He is the god of life, death, and rebirth. Osiris had an angry brother named Set. Set was the god of evil, and he plotted for many years against Osiris. Finally, Set put his plan into action. He tricked Osiris into climbing inside a coffin. Set then closed the lid and flung the coffin containing his brother into the river. The coffin floated downstream. Finally, it ran aground in the city of Byblos in Lebanon. There, the coffin lodged itself upright against the bank of the Nile. A tree took root. It rapidly grew around the coffin, enclosing it inside a sacred tree. Meanwhile, Osiris's poor wife Isis was horribly distraught. She had no idea where her husband had disappeared to. She went searching far and wide and finally came upon the sacred tree. In order to rescue him, Isis first put herself in the good graces of the King and Queen. Then, while visiting their palace, she asked that the tree be brought into the great hall. The King and Queen granted her request. When the tree arrived, Isis quickly rescued her husband, Osiris, from his wooden prison. As a gesture of gratitude to her gracious hosts, Isis had a pillar constructed out of the remains of the sacred tree. She annointed it with myrrh, wrapped it in linen, and consecrated it. From then on, the pillar was known as the djed pillar. Djed pillars could be found surrounded by a cartouche, along with other power symbols, and even a person's name. The cartouche acts like a rope, tying the symbols and name together into a single package. 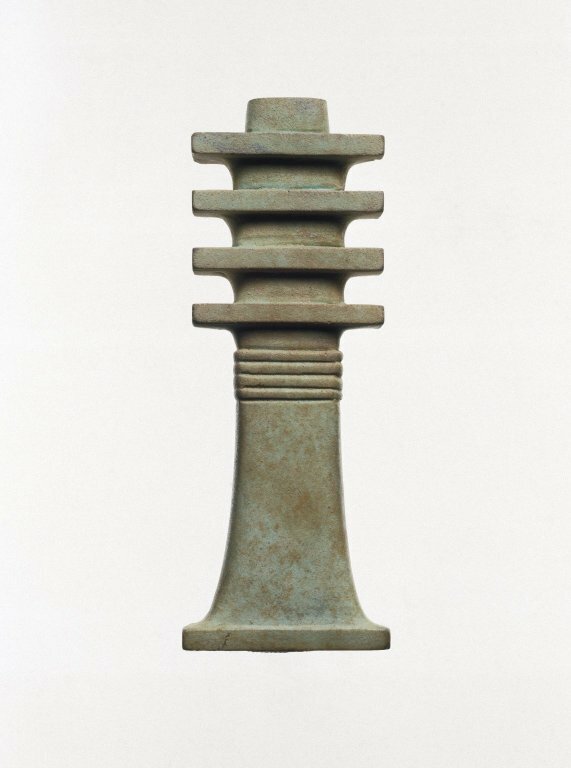 The djed pillar could be found on a seal ring, along with other symbols and hieroglyphs to form a message. Example: "Ptah the one with durable favors" Here, the word durable would be symbolized by the djed pillar. Wide, stable base, and balanced upper arms. Just as a great tree is hard to uproot, a sturdy pillar is hard to knock down. The djed pillar symbolized standing tall and unmoving in the face of threats. A djed pillar could represent the power to hold a roof above one's head. Like a tree, the djed pillar could offer safe-haven for birds to land in its branches. The djed pillar could be tall enough to offer a distant view to those standing on top. The djed pillar is large enough for a person in trouble to find it from afar and seek refuge in its strength. Can be found in the form of jewelry. Is said to inspire a person to take on its qualities of strength and stability. So there you have it. Now you know all about the fascinating ancient Egyptian Djed pillar. See if you can spot one next time you look at a photo of an ancient temple, tomb, or a sarcophagus. Think "stability" and you'll have it. Egyptians loved stability. Maybe that's why their kingdom lasted for so long and is still talked about today.